It was a beautiful afternoon in Perast, Montenegro, a village tucked away in the heart of Southeastern Europe. Snow-capped mountains pierced the sky over the periwinkle blue bay, oranges and lemons swayed from tree branches, and bees zipped from one wisteria flower to the next. Finding a wooden bench next to the Bay of Kotor, my husband and I sat down and proceeded to enjoy our picnic lunch. Two mischievous cats stopped by and requested a morsel. We obliged. After their feast, they lounged in the sun by our feet. Despite it being a perfect spring day, Perast was mostly quiet. This lack of tourists is precisely why we love traveling outside the peak season. A fisherman rowed his boat through the glass-like water, disrupting the reflection of Perast’s Baroque palaces lining the waterfront. Many of these white stone villas had been built in the 17th and 18th centuries when Perast came under the control of the Venetian Republic. 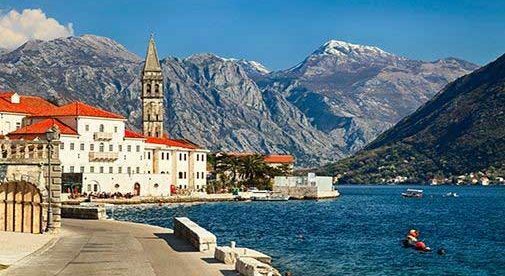 Today, Perast, as well as the entire Bay of Kotor area, is a UNESCO World Heritage Site. In the summer months, cruise ship passengers and tourists make day-trips from nearby Dubrovnik, Croatia. As a result, they flood coastal Montenegro’s beaches and roads. However, in the off-season, the area is quieter and more affordable. We paid the monthly rate of $490 to rent our apartment in nearby Kotor—a price that could easily be four times higher during the summer. Even the bus ride from Kotor to Perast was affordable, costing only €1 per person. We shared the bus with friendly teenagers and retirees happy to answer our questions about the route. Brushing the crumbs off our laps and bidding the cats farewell, we set off to get closer to Perast’s most iconic sites—two small islands in the center of the bay. Naturally, we were delighted when a boat owner offered to take us to the larger of the two islands, Our Lady of the Rocks, known locally as Gospa od Škrpjela. As the boat’s only passengers, we commandeered the best seats. From there, we were able to marvel at the views of the fjord-like setting. As we entered the bay, the massive bell tower of the St. Nicholas Church on the mainland was dwarfed by the rugged mountains towering overhead. On a mountainous peninsula across the bay, we spotted an abandoned village nestled into the steep slopes. It seemed to be accessible only by foot. Within minutes, we arrived at Our Lady of the Rocks. The history of the island’s blue-domed church is as appealing as its setting. According to legend, the island is entirely man-made. It is said to have been created over time by sailors tossing rocks into the bay. Eventually, a church was built on the artificial island. For centuries, Perast was a hub of maritime activity. Seafarers visiting Perast would stop into the 17th-century church to pray for a safe journey. Today, some of the church walls are dressed in silver plaques, left behind by thousands of pilgrims over the centuries. The church’s caretaker told us that some locals still commission silversmiths to craft these works of art. Returning to the mainland, we stopped at a restaurant on the water’s edge to enjoy coffee and dessert. We’d heard that there were ancient Roman mosaics just up the road and had originally planned to go see them that same afternoon. However, as we soaked up the sunshine and took in Perast’s Alpine-meets-Mediterranean vistas, we decided to save that journey for another day. We simply needed more time to savor Perast. Sign up for our free daily Postcard e-letter and we'll immediately send you a FREE research report on the most desirable -- and cheapest -- retirement havens available to you today. Each day you'll learn about the best places to retire, travel, buy real estate and enjoy life overseas.